Saturday Jeffrey was sick or something. Out of his own will and volition he decided to take me shopping. Any man who does that has to be sick or something. I think he really was just stalling and didn't want to put the tile down in the bathroom. At any rate, it was a very fun filled day. We went to Cafe Rio for lunch, and I am now converted. I have heard people rave about the salads, and I always thought to myself "it's a salad, people, it can't be that good." I am pleased to announce that I was wrong. It is not just a salad, it is a little bite of a fiesta in your mouth. Wow, that tomatillo dressing was exquisite! 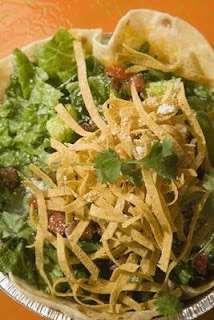 For anyone who has never tried the salad, I exhort you to get out there, and join in the fiesta! Keith also loved going out to eat, but mainly I think it was just the fact that we let him man his own drink. He was so proud of himself for drinking and not spilling (even though he tipped the glass upside down on top of himself. Thank goodness for those lids. They are surprisingly tight), and he loved the straw. After that, we got to go shopping! I found a chair with so much potential. "How much is that really ugly yellow chair?" I guess they didn't think anyone would want to buy an ugly chair, but let's be honest, folks. It has great bone structure, beautiful wood, and a gorgeous carving on the front. If only I could get rid of the fabric. So, on internet surfing the other day, I found a step by step tutorial on how to reupholster wing back chairs! (If anyone knows anything about reupholstering chairs, now would be a good time to come forth before I ruin it in my attempt). After the beautiful chair, Jeffrey wanted to go on a date, so we put Keith down for the night and watched our new movie. Nacho Libre. That chair has a lot of potential! Cafe Rio is really good, isn't it? If you're a Coke drinker something's up with their Coke... it's exceptopnal! I LOVE Cafe Rio! I'm so glad you got to try the fabulous dressing. Really, there's nothing like it. I wish I could help with the reupholstering thing, but I'd be even more lost than you. I think that chair is really cool looking. My parents have reupholstered a lot of chairs but I haven't! Good luck with the project! Natalie is good at that kind of stuff but I have never attempted it...sorry no help here.